Most managers have to rely on point in time accounting ratios that are often misleading. AFG’s Economic Margin corrects these accounting distortions and systematically applies bottom-up fundamental analysis to identify mis-priced companies around the world. Our data driven research process has been measuring how global markets reward and punish firms for over 20 years. We go through an extensive quality control process of data we receive such as fundamental, earnings estimate and pricing, which will be flagged if there are any anomalies that need to be investigated and potentially corrected by an analyst. This production process happens weekly to incorporate updated company fundamental and earnings estimate revisions that may have happened. Company pricing data gets updated daily, which impacts deviations from intrinsic value and the relative rankings of factors. 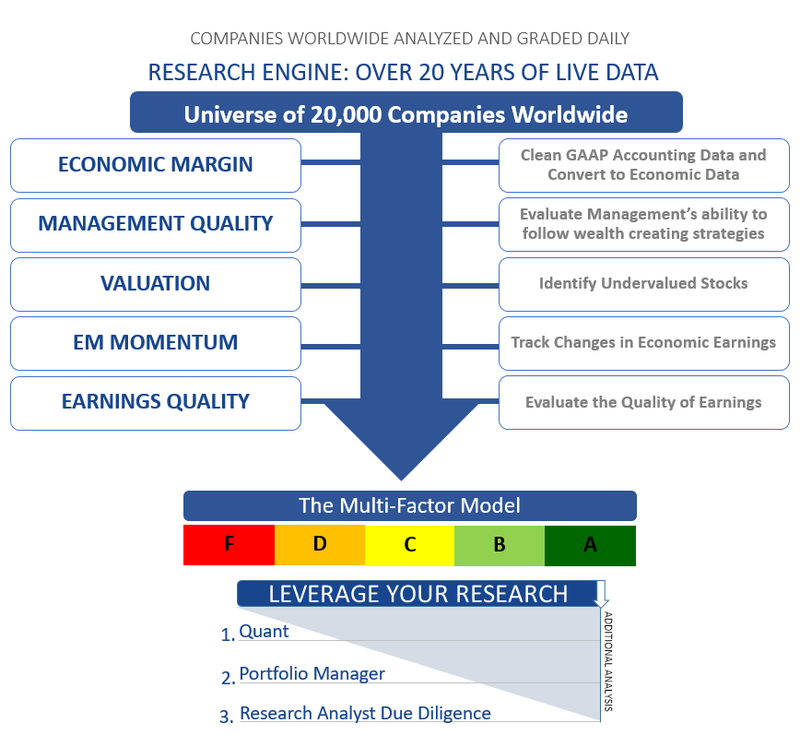 Once the data has been cleansed, AFG’s quantitative equity research engine systematically applies bottom-up fundamental analysis on over 20,000 companies worldwide to build proprietary factors. and gain actionable market intelligence. This ability to quickly and efficiently assimilate a broad range of information, and build complete discounted cash flow models on a vast number of companies, yields unparalleled advantages in constructing equity strategies. Clients can harness our intellectual capital through AFG’s research platform designed for Portfolio Managers and Analysts to leverage their research efforts and improve performance.